Reginald Cecil was born in Plungar, Leicestershire on 21st December 1887. For most of his childhood he lived with his Aunt Isabella and Uncle Charles Gale at Downfields Farm in Muston. In 1901, aged 13, he worked as a servant and cowboy at Robert Norman’s farm on Woolsthorpe Road, Muston. By 1911 aged 20, he had moved on to work as a farm labourer at Barnstone for Mr. Jesse Parnham. 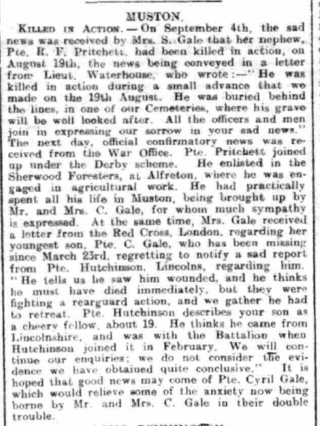 By the date of his enlistment he lived in Alfreton, Derbyshire earning his living in agricultural work. 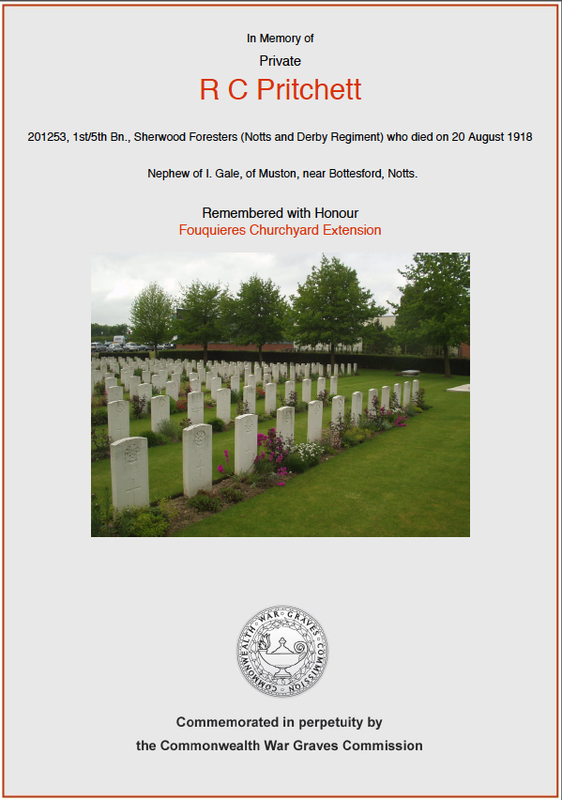 He joined the 1st/5th Battalion of the Sherwood Foresters (Notts and Derby Regiment) and served as Private. No record survives of the date of his enlistment, His Service Number was C and then 201253. His first service number indicates he joined up soon after the outbreak of war. 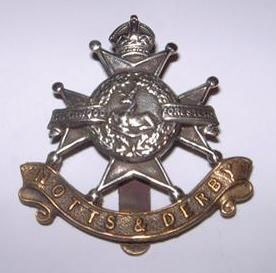 1/5th Battalion was formed in August 1914 in Derby as part of Notts. & Derby Brigade in the 46th North Midland Division. On mobilisation it moved to Harpenden and went on in November 1914 to Braintree before overseas service in France on the 25th February 1915. Reginald Pritchett’s Unit became part of the 139th Brigade on the Western Front. – The German liquid fire attack at Hooge, The attack at the Hohenzollern Redoubt. 1916 – The diversionary attack at Gommecourt in the Battle of the Somme. 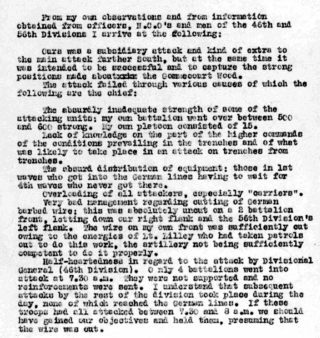 According to observations recorded in the 1/5th Battalion War Diary by T.F.C. Dowman an Officer with “A” Coy, No. 3 Platoon. The official report concluded the attack a success in terms of tying up enemy resources. 430 men were needed to replace those lost through death, injury and capture by the Germans. Reginald Pritchett survived the Battalion’s front line service on the Somme. – Operations on the Ancre, Occupation of the Gommecourt defences, The attack on Rettemoy Graben, The German retreat to the Hindenburg Line, The attack on Lievin, The Battle of Hill 70. 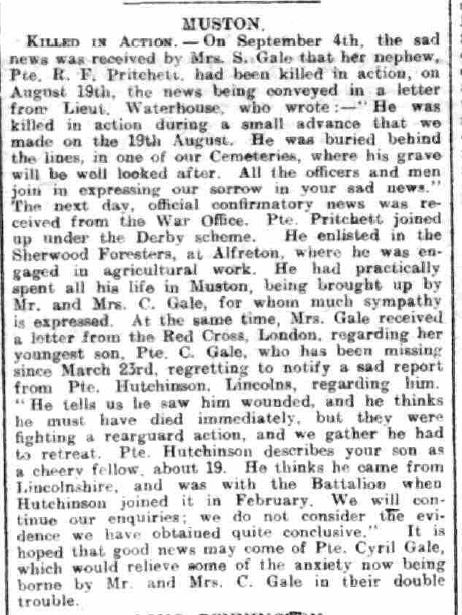 Reginald survived until late summer of 1918 when he was killed in what his Officer described as a ‘small advance’ on the 19th August. 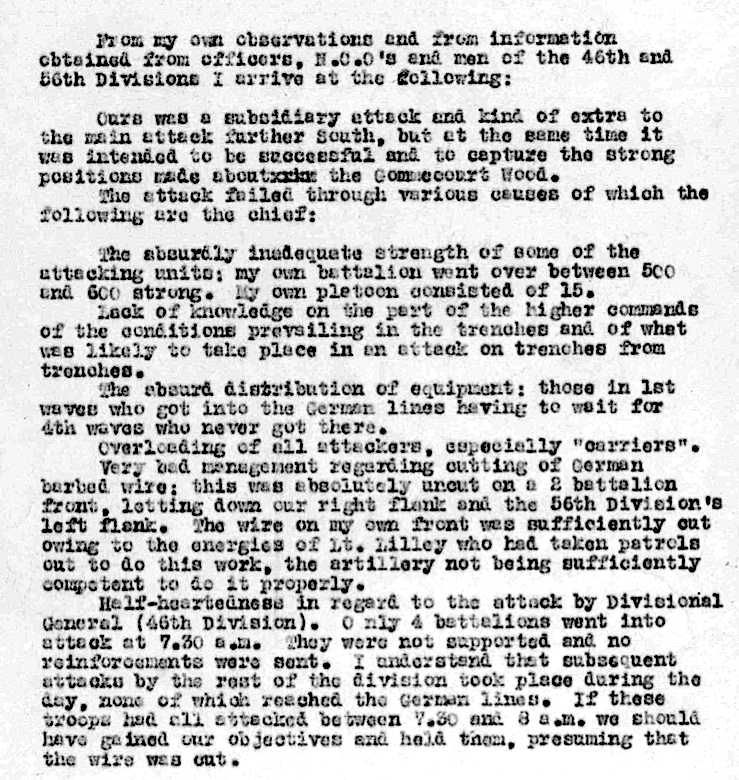 The War Diary immediately prior to the 19th provides further details. That ‘small advance’ cost the the lives of 10 men and wounded another 32 in addition to the many German losses. Reginald Pritchett was one of those ten men. The ferocity of those final days of the conflict continued without abate until November. As a seasoned survivor of four years of conflict Reginald’s Pritchett’s loss would have been of note to his Battalion. His Commanding Officer, Lieut. Waterhouse wrote to his Aunt and Uncle in Muston. He is buried with other men of the 1/5th Battalion Sherwood Foresters in the Fouquieres Churchyard Extension in Fouquieres, in Northern France 11 kilometers west of Le Touret where he was killed. The great majority of the graves at Fouquieres are those of Territorial soldiers, 249 of them from the 46th (North Midland) Division. Isabella and Charles Gale published the following memorium in the Grantham Journal on the 14th September 1918 to the nephew. They would subsequently have the solace of knowing where he was buried and be able to in organise his headstone inscription.